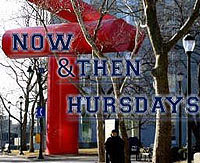 Now and Then Thursdays: A Cracked Waterpipe Caused This?! 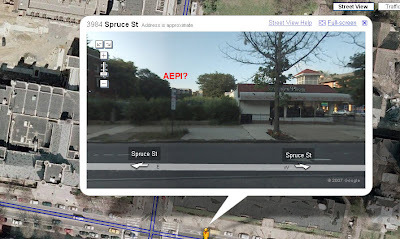 I was just checking Google's new "Street View" option for Penn's Spruce Street and was dismayed to see this! That lot used to be where (my fraternity) AEPi (3940 Spruce Street) once resided. 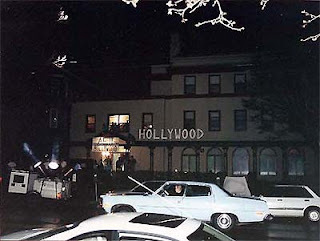 To take a brief trip down memory lane, check out my 1993 pictures below of the AEPi house during our annual "Hollywood" party. Every year we'd plaster the quad with flyers, rent lights out front and canvas the entire first floor of the house with B-rated movie posters we'd get from that video place on Locust (whose name I'm forgetting). 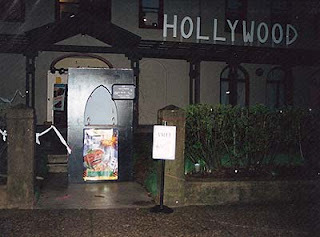 You'll also note the "Hollywood" marquee and ticket booth. Nothing like "themed" fraternity parties. Have you taken a peek at the 700+ Penn related videos we've got?